1. Wheeling Steel Radio Show Bus, Wheeling, W. Va.
Wheeling Steel Radio Show Bus, Wheeling, W. Va.
Four people are standing outside a Wheeling Steel, the Musical Steelmakers, bus, in Wheeling, West Virignia. 2. Wheeling Steel Radio Show Announcer, Wheeling, W. Va.
Wheeling Steel Radio Show Announcer, Wheeling, W. Va. 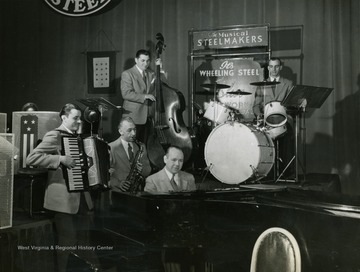 The Rhythm Rangers were radio stars on the "It's Wheeling Steel" radio broadcast, which was created in 1936 by Wheeling Steel Corporation advertising executive John L. Grimes. The radio broadcast was ran and operated by company employees and family members, the first of it's kind to utilize this model. This free, live performance, at the National Cornhusking Championship in Marshall, Missouri was a way to advertise the broadcast to a broader audience as well as to promote their products to farmers in the area. 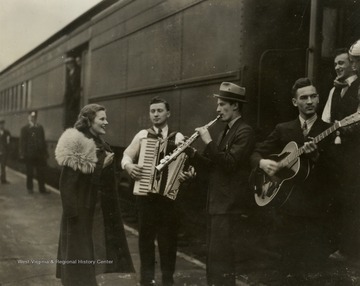 Group of musicians are likely members of the Rhythm Rangers, performers on the "It's Wheeling Steel" radio broadcast. This broadcast began in 1936 as a way to promote both Wheeling Steel Corporation's products and their employees who exclusively ran and performed on the broadcasts. The group of musicians is likely the Rhythm Rangers. 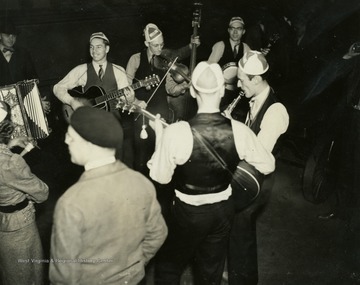 These musicians, like all employees of the "It's Wheeling Steel" radio broadcast, were either employees or family members of employees of the Wheeling Steel Corporation. This radio broadcast was company advertising executive John L. Grimes idea to promote both the company's product and its employees. It began broadcasting in 1936 and ended in 1944. 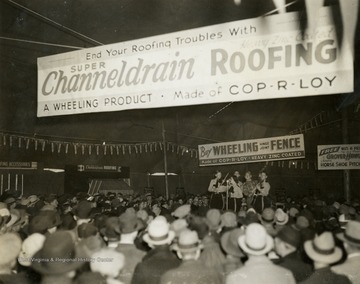 These performers were likely musicians on the "It's Wheeling Steel" radio broadcast. This radio broadcast was created by John L. Grimes, advertising executive at Wheeling Steel Corporation. The broadcast was ran exclusively by employees and family members of the Wheeling Steel Corporation. This excursion to Missouri was used to spread the name of the growing broadcast as well as to promote their products, including COP-R-LOY. 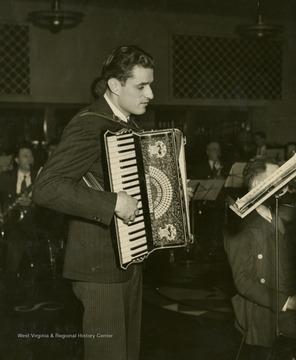 "Tony Biacco, steelmaker from Yorkville possesses two strong hands with which he capably handles ductillite and his accordion. His appearances on the family broadcast have been highly commendable. 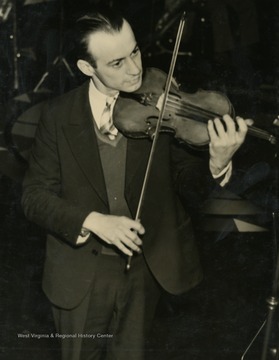 Now a regular in orchestra in 1943." 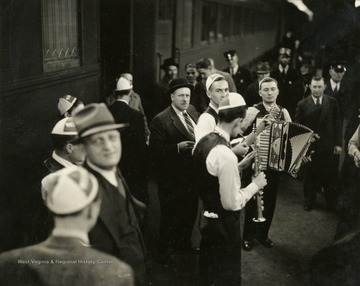 "The Steelmakers accompany Tom Care, employee from the Steubenville Works, as he headlines with a trumpet solo. 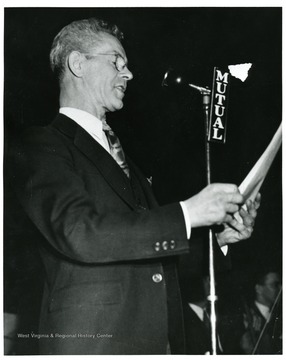 Tom played "At The End Of a Perfect Day", which appealed to a great number of Wheeling Steel's nation-wide family." Caption on back of photograph reads: "Here's the same quintet on Sunday, running over a number before air time. 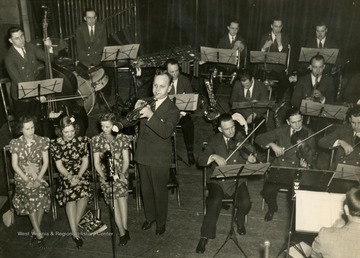 Lew Davies is the conductor of the program's 23 piece orchestra of mill, plant, and office workers." 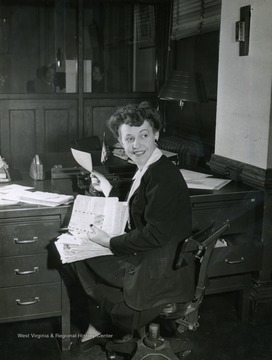 Caption on back of photograph reads: "Part of Regina Colbert's lunch hour is devoted to catching up on correspondence with service men at home and overseas. The "Singing Secretary" writes weekly to a number of men in uniform." Regina Colbert was a performer on the "It's Wheeling Steel" Radio broadcast. 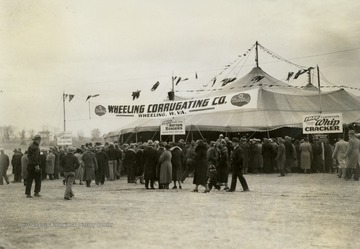 This broadcast was ran exclusively by Wheeling Steel Corp. employees and family members, but as the program grew in popularity they began to hire performers with professional backgrounds, like Regina Colbert. However, in order to comply with his rule of an all employee only run program, he would hire these professionals to work in the offices for a period of time. In Colbert's case, she was hired to work as a secretary in the advertising department. 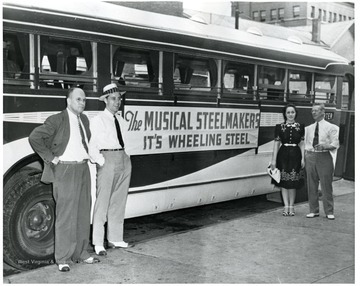 The Wheeling Musical Steelmakers were a group that would regularly perform on the "It's Wheeling Steel" radio broadcast, created in 1936 by John L. Grimes who wanted to promote both Wheeling Steel Corporations products and their employees. John Wisvari's day job was a pipe-threader at the Benwood Works.